After unveiling the same at the Consumers Electronic Show (CES) in Jan this year, Samsung has now launched its Galaxy NotePRO tablet in the Indian market. Priced at Rs 65,575, the tablet is one of the most expensive tablets in the Indian market as of now. Only the Apple iPad Air's 128 GB version with Wi-Fi + Cellular matches it price at Rs 65,900. Apart from the NotePRO tablet, the company had also unveiled three Galaxy TabPRO tablets that sport a 12.2, 10.1, and 8.4 inch displays. Here is a look at the specifications of the tablet. The tablet sports a 12.2 inch WQXGA Super clear LCD touchscreen display (2560x1600 pixel resolution) and runs on the Android 4.4 KitKat operating system. In addition, the tablet come with a personalised Magazine UX- specifically optimised for a large screen- that allows users to further tailor their Galaxy tablet experience. The UX enables them to organise their favourite content in an easy-to-use dashboard with automatic feed or news updates and then quickly access the most frequently used apps. It runs on the Exynos 5 Octa (1.9GHz quad-core + 1.3 GHz quad-core) processor and has 3GB of RAM. It comes with 32 GB / 64 GB of internal memory that can be further expanded up to 64 GB with a microSD card. Galaxy NotePRO tablet has an 8 MP autofocus camera with LED Flash that can also record full high definition videos (1080p), as well as a 2 MP front facing camera for video calling. On the connectivity front, the device has Bluetooth 4.0, Wi-Fi (with Wi-Fi Direct), 3G & 4G LTE (depending on the region), as well as a USB 3.0 port and a microSD card slot. Multi Window: Enables users to split the screen up into four different windows, as well as a virtual keyboard, providing them with enough space to type comfortably. Samsung S Pen: Included with the Galaxy NotePRO, the S Pen delivers a more responsive and productive tablet experience with access to features such as Action Memo, Scrapbook, Screen Write and S Finder, among others. Pen Window: Enables users to simply draw a window of any size on the screen, and instantly access in-application features such as YouTube or a calculator. Remote PC: Allows users to access and control their home or office PC directly through their Galaxy NotePRO or TabPRO in order to seamlessly edit and save files remotely. It will also come pre-loaded with Cisco WebEx Meetings platform, a leading web conferencing solution that will enable users to share anything on their screen as well as start a WebEx meeting from their contact list. Samsung e-Meeting also provides collaboration capabilities by giving users the ability to share content during a meeting without having to access a central server or network. 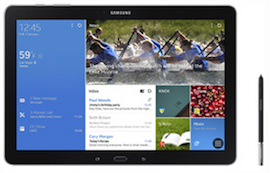 Samsung is also offering a free cover worth Rs 3,799 if you purchase the tablet as of now.